The Brooklyn Hospital Foundation's Young Leadership Council (YLC) invites you to join them on May 19, 2019 in Brooklyn’s beautiful Prospect Park for the first annual Champions for Child Life 5K Fun Run. This multi-charity, family-friendly event includes a wide range of participants from our community. We ask The Brooklyn Hospital Center's Friends, Trustees, Leadership, Physicians and Staff to join together in support of the Hospital, to promote an active lifestyle and showcase our partnership to the community. All proceeds raised from the race will fund our Child Life Program. ​• ​Participants of all ages and abilities are welcome​ - whether you're a pro-runner or just want to enjoy a spring stroll in the park. • The event will feature chip timed results. • Top finishers and top fundraisers will receive awards. • All participants who finish will receive a medal. That's ok! Make a fully tax-deductible gift. Donate now to show your support! The Brooklyn Hospital Foundation (TBHF) raises funds for cutting-edge medical equipment, new programs, medical student education and staff training that improves patient care at the Hospital and promotes the overall health and wellness of Brooklyn residents. Funds raised from the Champions for Child Life 5K Fun Run will support our Pediatric Child Life Program. 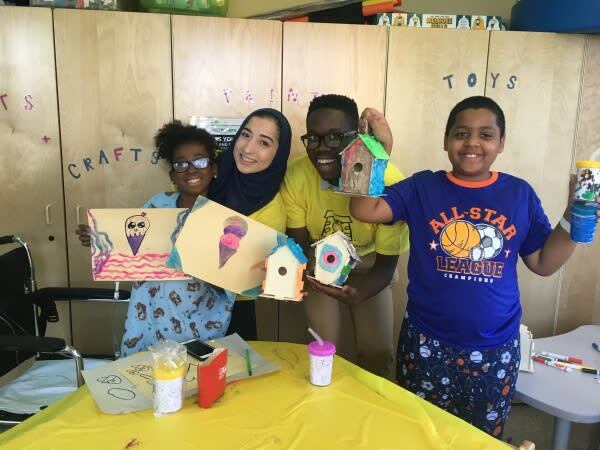 The Program provides developmental, educational, social and emotional support to pediatric patients of all ages through a variety of therapeutic activities. Enrichment programs – such as weekly clown shows, therapy dog visits, arts and crafts activities, games and music therapy – and healing play provide comfort and ease pain during a stressful hospital stay. This event is brought to you by our Young Leadership Council (YLC). The YLC is a caring group of young professionals that supports TBHF's efforts to promote The Brooklyn Hospital Center to their peers and the wider community. Through their dedication, the YLC helps us raise awareness and funds that support critically-needed projects at the Hospital.